El Nino helped fuel storms across the U.S. in 2015, but as it weakens, meteorologists are watching out for this. 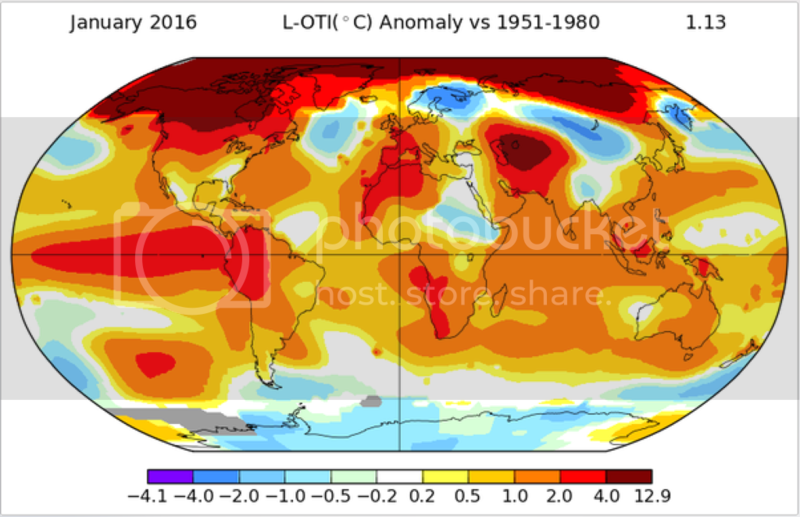 Saturday, February 20, 2016, 7:00 -	Lately it is becoming more common to see global temperature anomaly maps covered in orange and red month after month. 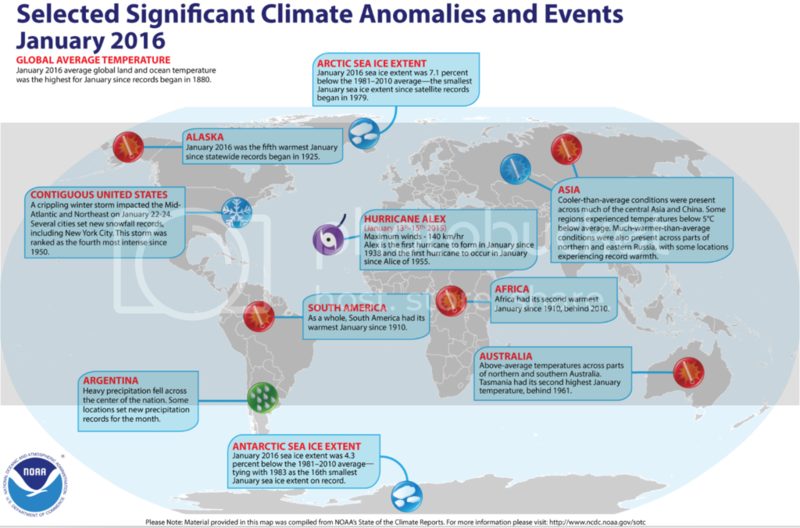 Recent NASA data has revealed that the last three months of 2015 and now January 2016, have been the four largest monthly global warm anomalies since 1880. Earth's warmest January on record is also the overall month with the largest warm departure from average, +1.13 degrees Celsius or +2.034 F. Following closely are December 2015 +1.12 F, October 2015 +1.91 F and November 2015 1.84 F.
Other top Meteorology institutions like the Japanese Meteorological Agency or the European Centre for Medium-Range Weather Forecasting also concluded that this was the warmest January ever although the temperature anomaly departure was not necessarily the greatest compared to the later months of 2015. What areas where warmer in January 2016? A quick glimpse at the temperature map is sufficient to locate the regions of the planet that stand out as the most anomalous in terms of contributing to the positive departure value obtained for the month. A very warm pattern extends west to east along the northern hemisphere polar latitudes, anywhere from Alaska, Canada and Greenland into northern Russia. The temperature departure values for this specific region are in a different orbit, with some averaging 23 F above normal, and NASA calculations show that north of 75 degrees north latitude the January average temperature is 12.65 F above average. Other areas showing moderate positive temperature departures (3.6 to 4.5 F) are the equatorial and southeast Pacific, Indonesia, northwest and southwest Africa, northwest South America, southwest Europe and especially southwest Asia around Uzbekistan, Turkmenistan, and Kazakhstan. Departures of +1.8 F are common in many regions of the tropics and subtropics. Only a few spots around the globe show weak negative departures as is the case in the north Atlantic, Antarctica, northeast Africa, Scandinavia, central Russia and the Kamchatka peninsula in far eastern Russia. What made January 2016 so warm? The strongest El Niño on record is responsible for a great part of the warming that has been measured around the globe over the past 6 months, but a much warmer Arctic region along with a greatly reduced ice sheet, have also had a considerable impact on January´s overall temperature. Warmer conditions over land and ocean areas, caused sea ice to reach a new record low for the month of January, 402,000 square miles, according to the National Snow and Ice Data Center. Just to get a more realistic idea, the missing sea ice is close to the size of the four corner states together, tremendous! 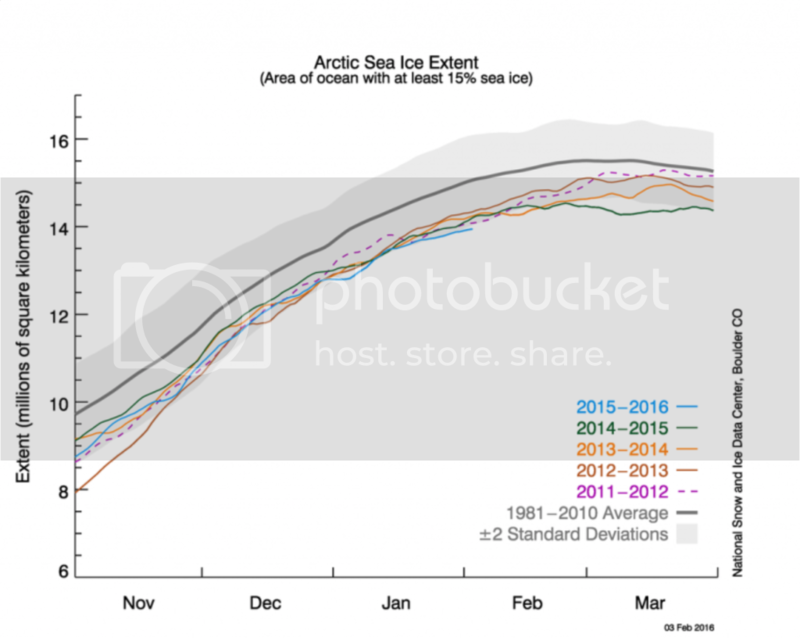 Ice continuous to dwindle year after year, and at this point in time we have much less Arctic sea Ice than the average of many years and less than any of the past four winters. So what will the rest of 2016 be like? SPRING IS HERE: How will El Niño affect your spring? Find out on The Weather Network’s Spring Forecast, premiering March 1, 2016, on theweathernetwork.com and on The Weather Network's app on Apple and Android TV! For some, the continuous poring of human made greenhouse gases into the atmosphere is the main cause of the very warm temperature departures we are observing, and that will just go on during the rest of 2016. Some Research Centers like the UK Met Office, have already released a 2016 forecast showing another record warm year or at least close to what was observed in 2015. 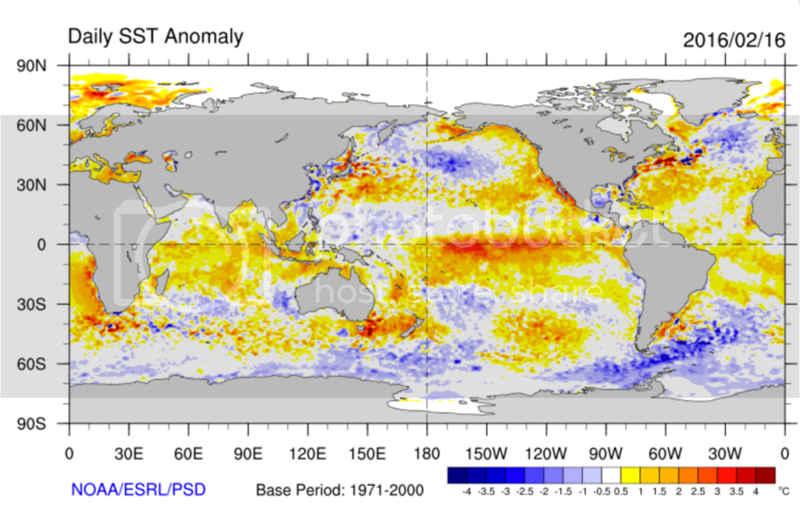 However, we can't forget that SST anomaly model predictions are leaning towards a weakening of El Niño by Spring and the possibility of having La Niña step into the scene as early as this summer. RELATED:	Will El Nino hurt or help drought-stricken California this winter? We examine. If this ends up being true, we should see a cooler equatorial Pacific during the second half of the year, which should overall contribute to lowering the 2016 global average temperature. Although the water temperatures in the Pacific have a lot to say about how warm a particular month or year can be, there are many other atmosphere-ocean factors capable of tipping the balance in either direction.